An afternoon of getting close up and personal on Durisol blocks, I am very impressed and so is the hubby....makes a change from "we must go down the traditional route of block, cavity, insulation and more block"....NO.....get with the programme! We are hoping this will also solve the problem for the daughter who has a steel frame to contend with, just spent 10 mins on Sketch up drawing a block with a stanchion in it...seems to work, anyone got any good ideas on cold bridging issues going down this route? We don't have a lot of room on one side as the land belongs to someone else and the building is very close to the boundary, just enough room for cladding and that's about it! The steel will be covered by 40mm of block and whatever cladding she decides on. Somebody on here has just started the exact same thing, they discounted durisol and went with nudura as it was easier to build in the stanchions. Not entirely sure what you are building but Isotex (which is similar to Durisol) have column blocks which we will probably use in our build for 2 columns supporting the overhang on the first floor. The website is Insulhub. I may have completely the wrong idea about what you are trying to do though. If the stanchion crosses from outside through both the insulation and the concrete of a block, then you have a cold bridge through the Durisol. The only way of designing out the cold bridge caused by steel is to build the blocks round the (outside of the?) frame. What did the Durisol trainer suggest when you asked him (Durisol is the most overtly sexist company I have ever met) the same question? Well I was rather pleased with the reception, different area maybe. As my daughter and l have spent all the time researching and the hubby "doing" we appear to know what we're talking about (we are very clever at hiding the "I really have no idea what your talking about" syndrome!) Thanks for the advice, and yes it may cause a problem. 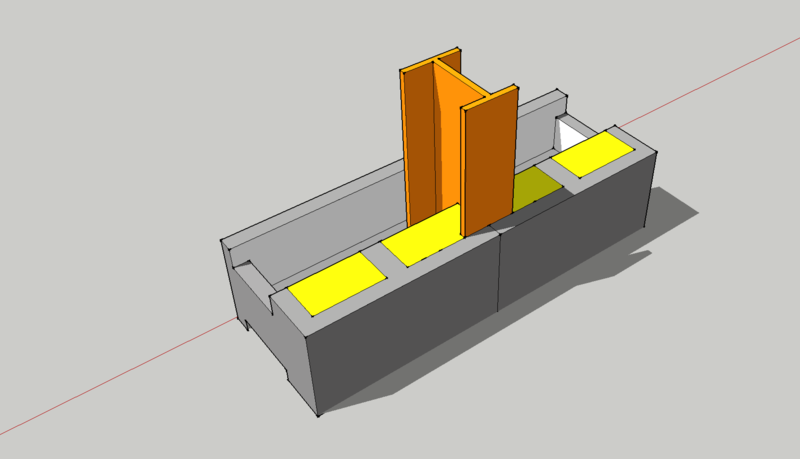 We are hoping to foam the stanchions first somehow and cut the blocks around them, they were happy with my sketch up design, see below. Because of PD we are not permitted to go outside of the existing build at all. Our lady rep suggested a mesh under the finish plaster to eliminate hairline cracks, have you plastered yet (not in the pub)... Face blocks on edge above doorways with rebar, cut the top off to get the same height as the walls. Hubby has gone along this morning to watch the pour....they didn't seem to have any platforms inside to assist when walking around with the pump, that should be interesting as on the outside there is a 2.70m drop into the void....hmmmm! Are you happy with these blocks, I saw you had problems earlier, it must have been a nightmare, like the 1987 wind that ripped through here and took my barn roof off! Russell, we decided against Nudura as after looking at a couple of builds thought that it was really not for us. When you have another half who has to be dragged out of the "ice age" , (he knows how I think)....it's a problem. Fair due to him though he gave it a go and went on the course. He wasn't keen on the cost of putting up this system, there's a lot a rebar and labour involved, we saw some horrendous sights, wavy walls, blow outs etc., Not for us. He was really against solar until recently when it was get it our loose out of the FIT's we now have 33 panels and they are going great guns, he's telling everyone down the pub now! The only thing that makes me wonder is the (sometimes) corrosive effect of concrete on some metals. I can't for the life of me remember who knows about that - was it @Ian perhaps or @readiescards ? Hope they bump into this thread. Thank you AnonymousBosch, I'll have a look and see if I can find the thread. Thank you Ian, most informative, we were thinking of painting them at one point, but I see your thinking on this. Cheers. Hubby went to see the pour today, concrete turned up with 20mm ballast and the wrong slump, they had to send it away and wait for the right stuff, he said it went very well, no blow outs, bit of water seeping, he's going along for the waterproofing on the outside in a few days time....we're sucking diesel! I'm not sure that one can distinguish between the level of inaccuracy in all three dimensions : because the inaccuracy to which you refer may well be caused by the variation in drying rates (I think). I say that because I have seen the production process in detail and looked at the drying process on the same trips to the factory. 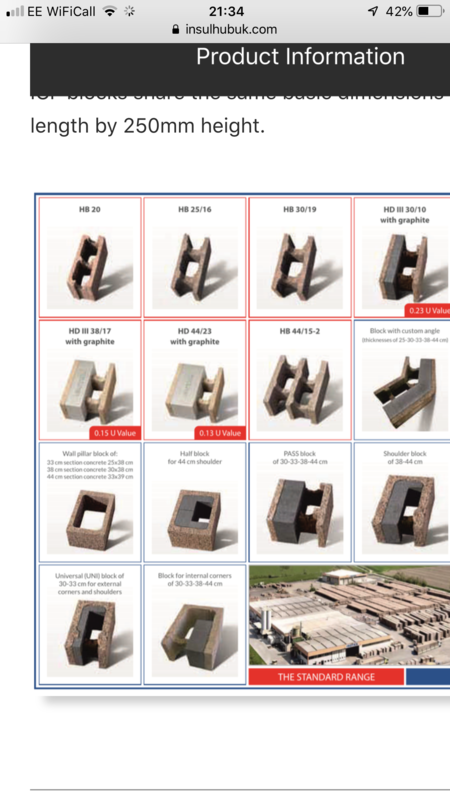 My guess is that inaccurately dimensioned blocks would be more likely to have been stacked on the edge of the drying stack. The drying process - after an initial drying period, takes place in stacks of blocks . Blocks on the outside of the stack cannot but experience different drying conditions to those in the centre of the stack - the production manager's argument was that all blocks are stacked in the same atmosphere - which was true. It would have been churlish of me (at the time) to push the point any further. But blocks on the outside of the stack would have been subject to drafts and local variations far more so than those inside the stack. All the blocks come off the (Austrian) block-maker correct to the millimeter. I know, because I measured a small sample in front of the manager. But to claim that there is (will be) a significant difference in contraction (solidification) in one dimension rather than all three needs evidence, please. Full disclosure: my house is built with Durisol, and while I would build another using the product I would sample delivered blocks at the time of delivery and reject pallets of blocks that vary more than a few ( 3-4) mm in any axis. Why 3-4 mm? Its a real pain in the Botticelli to compensate for more than 2mm variance in a layer of blocks. Full disclosure: my house is built with Durisol, and while I would build another using the product I would sample delivered blocks at the time of delivery and reject pallets of blocks that vary more than a few ( 3-4) mm in any axis. Why 3-4 mm? Its a real pain in the Botticelli to compensate for more than 2mm v﻿ariance in a layer of blocks. couple that with info from a builder who has used them more than once who also mentioned same thing but up to 5mm difference ,without any prompting . It is enough to make me think it is a slightly annoying problem that is a continuing issue..
the move to exterior cladding now is something they did not see when they were first designed 40years ago ? not a problem with other blocks --why theirs? so to take this further you are saying it is the uk produced blocks that have the problem ? but maybe half the price ? All I'm saying @scottishjohn, is that I've become much analytical - not to say critical- about what suppliers (of anything) send me. In this case, the lack of accuracy in something as simple as a building block causes significant amounts of aggro downstream. For which I, personally, this time, have had to compensate. Less aggro sending it back and insisting on accuracy next time. And level (or laser) or taught string line, or all three. Check every single block for line and level.... Twice or three times. Hubby uses the laser a lot, marks the floor where the electric boxes are so that he can cut out acurately where the back boxes are in the plasterboard, seems to work Ok.. We are all really looking forward to this build now, it's been a long slog....I'm still waiting for permission for a basement, will know at the end of this month. It took 161 days for the silo's to be refused first time around....ridiculous! Today I drew up a new Tractor shed on Auto Cad....who hoo....it looks OK, had a temporary scaffolding system with a tin roof and were told "you have to have planning for that" errr why, it's temporary...but NO...SO...I'm going for the jugular...serves em right! I believe that the Isotex blocks have a finishing process after they have been dried that the Durisol blocks maybe don’t have or the process is less robust. Certainly, we could see the difference in the few blocks that we used on the training courses. The Isotex blocks were also smoother on the outside (you’d still need the gloves) but were obviously more “finished” than the Durisol blocks. It’s not a huge issue for us, it Is just another factor to add to the decision scales. Before I forget, beware of the dust caused by trimming the blocks. It gets in your eyes - and its vicious. Get an eye wash kit. And some form of eye protection. Hmmm...looking at the Isotex they don't have the edging as the Durisol block, not having seen these yet I can't make any decisions, but maybe they will be at Grand design show? Thanks for the safety aspect re the cutting and eyes, it's all being taken in I can assure you after losing the top of a finger in the family I am Super careful now of everything. I can assure you after losing the top of a finger in the family I am Super careful now of everything. I have 8 fingers left, of which 6 work well: the other two are only good for hooking underneath a pint glass and emptying the dishwasher - I can hang four cups on each - and I can hang unbelievably heavy weights from them - cant feel much. hello @hallega. Marginally off topic (well sort of). Thay picture of the two blocks, Was that done in sketch up. I keep thinking about the design software side of things. IS the block you have drawn saved as an item in the programme which you can then effectively cut and baste to make a wall?